Non-profit mobilizes Paul Cowie, arborist consultant, tree care provider Bartlett Tree Experts and Husqvarna Professional Products to donate tree removal and repairs at historic national parks. Liberty State Park, NJ (January 15, 2014) – As part of a proposed agreement in principle with the National Park Service, Project EverGreen has recently coordinated with Paul Cowie & Associates arborist consultants, Husqvarna Professional Products and Bartlett Tree Experts to donate removal and repairs of dead and dying trees and remedial treatment to damaged trees at both the Statue of Liberty National Monument’s 9/11 Memorial Grove and Ellis Island. The renovation work was a first step in a planned revitalization project to repair the 9/11 Memorial Grove on Liberty Island. However, before any new planting can take place, damage left by Hurricane Sandy’s flood surges -- which left the islands under several feet of sea water -- had to be addressed. The resulting soil damage left numerous dead and dying London Plane, American Sycamore and Pin Oak trees, which were a hazard to people and property in both parks. The work was completed on Ellis Island on January 8. Extremely cold temperatures and ice prevented the planned tree removal at the Liberty Island 911 Memorial Grove. That phase of the project is expected to be completed in early spring. 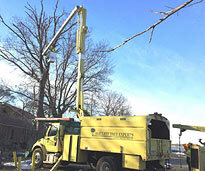 Project EverGreen partners Paul Cowie & Associates, Husqvarna and Bartlett Tree Experts provided extensive professional analysis, strategy and specific removal of the trees most damaged by the salt water. Specifically, Paul Cowie of New Jersey-based Paul Cowie & Associates’ provided an extensive tree care survey and management plan for both islands, a donation approaching $2,500 of in-kind professional fees; and Husqvarna provided a number of professional climbing, ground and felling saws for the project, equating to nearly $5,000 in retail value. Bartlett’s donation of crews, trucks and a chipper translates to an equivalent retail cost approaching $6,000. In total, the combined efforts of Project EverGreen and private sector companies volunteering their professional time, services, equipment, and crew labor resources, add up to $13,500 from all in-kind donations. A single tree can remove enough carbon dioxide annually to equal 11,000 miles of car emissions. Lawns are 30°F cooler than asphalt and 14°F cooler than bare soil in the heat of summer. Turf improves water quality by storing and filtering the water that would otherwise go into catch-basins and lakes. The natural absorption processes of trees and shrubs remove smoke, dust and other pollutants from the air. Fill out the form below to send an email to Dan Jacobs. Click on the Send button when you are ready. All fields are required.